Budweiser wanted the ability to measure the impact of the Made in America social events by a creative, technical solution that doesn’t interrupt the party experience for the consumers. 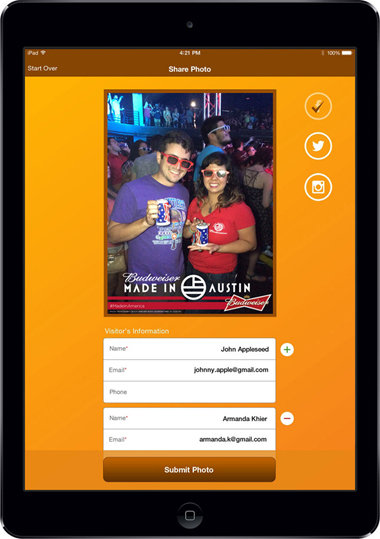 We provided an iPad app with machine learning cloud platform, which enabled branded picture taking with social media sharing and real-time cloud computing to provide analytics for the Budweiser marketing team. Budweiser’s marketing team now measure the impact of the event in social media by measuring the user photo share behavior, which providing valuable demographic data in real time. It helps them improves the next Budweiser event experience. Budweiser wanted the ability to measure the impact of the Made in America social events by a creative, technical solution that doesn’t interrupt the event experience for the consumers. We provided an iPad app with machine learning cloud platform. Which enable branded picture taking with social media sharing. 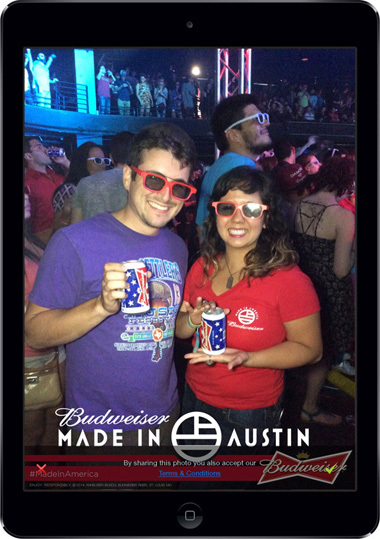 Budweiser’s marketing team gain a real-time analytics of the impact of the event in social media by measuring the user photo share behavior, providing valuable demographic data that help them improves the next Budweiser event experience.